Setting off for India, to Rajasthan, “the land of kings”, means risking the temptations of beauty and wonderment. 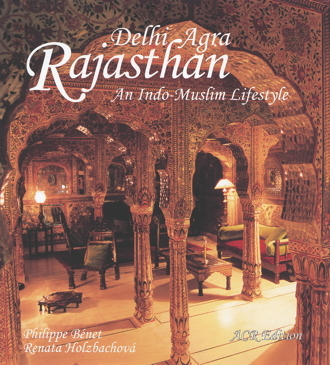 Bordering on the desert of Thar, uplifting into the blue sky the fortresses and the palaces of the Rajput princes, the fabulous tales of the maharajahs of bygone days relate the divine encounter between Hinduism and Islam. Islamic art, developed by the first Muslim conquerors in the eighth century, in Delhi spawned a very pure architecture of forts, palaces and mosques. The Moghul period offered the world several mausoleums that are masterpieces, like at Agra the Taj Mahal, “a solitary tear on the cheek of time”. In marrying a Rajput princess, Akbar, “the great Moghul” (1556—1605), who ruled supreme in India in the day of Henri IV, became an assembler and advocated syncretism in religious matters. Thanks to him we can discover his ghost capital, Fathepur Sikri. Borrowing elements from Islamic and Moghul art, the maharajahs of Rajasthan turned their fortresses into palaces of the Thousand and One Nights, to be liberally visited: Jaipur, “the pink city”, Jodhpur, “the blue city”, Jaisalmer, “the honey-coloured desert fortress”, Bikaner, renowned for its magnificent Junagarh fort, Udaipur, “the city of dawn”. And then there is the panache of these desert princes the authors met: maharajahs of Jaipur and Jodhpur; princess of Bikaner; maharana of Udaipur; Thakur and Rawal aristocrats of other kingdoms. For reasons of democracy and to earn a living, they had to turn their palaces into luxury hotels. A guided visit in the opulent suites of the Umaid Bhawan in Jodhpur, at Samode, the Lake Palace of Udaipur… Blending travel stories, descriptions of emblematic monuments of Islamic art in Delhi and at Agra, interviews with the princely families of Rajasthan who opened for A.C.R. Editions their sumptuous palaces, the authors offer us a colourful promenade through this exceptional country.